Content Website : Flamboyance and style are good but if you’re in the content business, chances are that you’ll be falling short of your mark. Substance, helpful information, and guidance, these are the important notions that make it count in the content arena. At Diligent, we love creating awesome websites complimenting your content with your online niche, a boost up content-mix for rising up from the rest. Online Portals : What makes a great website work even better, the right mix of technologies that take into consideration the user experience and the SEO. Diligent Web Tech for every type of online website!. Enterprise Intranet : The centre of all business activities, Enterprise Intranet forms a vital technological aspect for an organization by keeping the employees in loop and always connected. The well trained team of web developers at Diligent excel and making Enterprise Intranet, especially suited to your needs. Knowledge-base and Educational Websites : Educational Websites combine numerous other types of content such as video, infographics, audio apart from text. Diligent Web Tech has in the past created many compelling and and highly successful knowledge-base websites. A remarkably well designed Content Managed website featuring the Content Management System (CMS) allows the user to be in control of the website and easily update it, including adding new pages, editing and/or deleting existing pages. Wordpress : The simplicity of WordPress as well as the flexibility make it such an amazing tool for developers. The highly skilled team of experts at Diligent possess a rich experience with the platform, and over 17% of all sites run on WordPress. Joomla : The most popular Joomla enjoys extraordinary components; the built-in SEO plugins, the easy-to-use functionality as well as the global compatibility have made it a preferred tool amongst developers. An open source enriched with innumerable features. Drupal : Drupal is the ideal platform for developing big & complicated applications. Our team of Drupal experts have a life-long experience and have created dozens of Drupal platforms. Our clients are from small, medium and large-sized organizations as well as some Fortune-500 companies. Umbraco : An established open source Content Management System, Umbraco works perfectly on the .NET framework. At Diligent Web Tech, Umbraco is employed for web projects that need quick deployment with a corporate set up. Kentico CMS : The rising star in the CMS world, Kentico CMS is all in one complete package for your CMS needs. 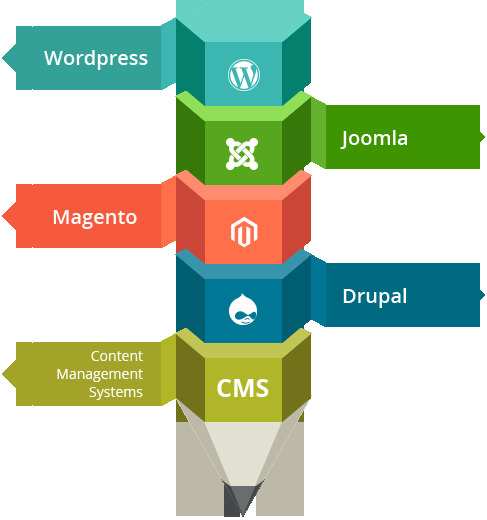 Our web development ninjas specialize in absolute content management systems using Kentico CMS including programmatic customizations, development, data migration, and integrations etc. One of the biggest advantages of using a CMS is that it is ridiculously easy and does not require any technical skills. On a very basic level, CMS is simply a software that stores your website contents, facilitating the creation and deletion as well as editing, publishing, and management of webpages. A CMS based dynamic website is database driven, rendering it a much faster speed than the static sites. This is in combination of the direct access to the content CMS allows for the site user. We didn't create only website, we create your business. We would love to hear from you!